The length of detailed reviews will range from minimum 150 to 600 words (a half of letter/A4 size page to full letter/A4 size page or more) depending on the type of release (single song, EP, album, double album) and reviewer's opinions. I collaborate with an English editor who proofreads my writing. The detailed review (or interview) delivery time: 14 business days (since the payment is recorded) either to your e-mail address (if submitted directly via Fabryka) or through the Music Xray platform. Short review: 5 business days (since the payment is recorded, on email or via Music Xray, as above). File formats: if ordered via the magazine - formatted .doc & .pdf with an artwork (band pictures if an interview) included; if via Music Xray - unformatted text only through their platform contact form. I prefer digital files (mp3, 320 kpbs the best). You don't need to pay any additional fees (like overseas CD shipping, printing posters, pictures). I guarantee that none of your songs will be used for any purpose other than the music review. No sharing, no piracy has been the policy at Fabryka IR&M Encyclopedia for the last 16 years. All downloaded files (you specify the download source; ie. Dropbox, WeTransfer, own label's music pool, etc.) will be deleted from my storage disk once the review is delivered to you and approved, and no additional copies will be made. My judgment is based on max 5-point rating scale (5=well done!) for the music content submitted via Music Xray as well as directly via Fabryka IR&M Encyclopedia. Max 4 stars rating was used before 2013. I pay attention to the idea, moods, arrangements, structure, depth, dynamics, potential, similarities to other bands' music, performance, mastering, production, artwork (if any), and also if a song is useful for a radio play, a commercial or TV/movie licensing. The lyrics are less important, but I may quote a line or two whenever it makes a good context. My writing is a copyrighted material, just much as your music. All copyrights reserved by Katarzyna 'Draconina' Górnisiewicz, Fabryka Industrial Rock & Metal Encyclopedia. Therefore, ordered reviews and interviews are provided under a non-exclusive commercial license for the purpose of utilizing/sharing the entire text, not just a quote. I want readers and listeners to visit your websites, social profiles, interact with you, and buy your music. That's why every published detailed review will include a few useful links incl. on-line stores (iTunes, Amazon, CD Baby, Bandcamp, and any other specified) where the readers can purchase a reviewed song/album. If possible, a player from SoundCloud, ReverbNation or Bandcamp with a certain song/album will be embed on a Fabryka IR&M Encyclopedia review site. No sales and views are guaranteed. Short reviews do not include said widgets/players! a) Detailed reviews, PR interviews: Fabryka IR&M Encyclopedia (continuously discovering and promoting ambitious music during the last 16 years), an individual page & link. Short reviews - Fabryka only, on one general short reviews page, with the same link for all reviews: here and part 2.
c) Verified Google+ page available to a few thousands of followers** (+12.400); a page post with an individual link (the link name is up to G+ only). Google+ is a social network opened for public in mid-2011, linked with YouTube, search engines, music players and other Google products. Short reviews are not published on above blogs & social networks. *SEO means an improvement for your band thanks to indexing and archiving my reviews and interviews by the Internet search engines (Google, Bing, etc). It will let others find your band easier (through keywords such as the band name, song title, album name, musician names, tagging other band names etc.) and become more familiar with your music. My pricing is competitive to other professional review services. Your payment can be sent through PayPal in USD currency (not Polish Zlotych or other currency please). It's a verified PayPal account and when I approve your submission, you'll be sent either a Paypal's 'payment request' on your contact email or a direct link to PayPal.me (Draconina's secure PP page). No refunds and returns – no physical items are involved. You will be asked to authorize my writing before it's published, however my honest opinion remains my own, therefore it should not be changed just because it's a paid writing, unless there was any incorrect information provided (such as a band member name, song/album title, release year, instrument etc). The artist is responsible for providing me with the most current professional information about themselves and his/her release before the reviewing process begins. PR interview may be a good solution to present your band in more or less official way. I do my best to ask original questions, which refer to topics preferred by bands and oscillate between music and non-music related subjects. Therefore, we can make it interesting for readers and comfortable for you - to promote your release(s), merch, shows/tour, videos or anything important what people may listen to, watch and/or pay for. 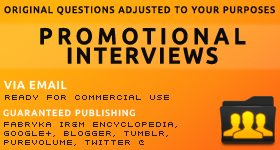 c) I will send the entire, formatted interview (.doc + .pdf files) on your email during the following 3 business days. I don't do audio interviews. Please contact me about the final rate if you're submitting for both review and interview. 5. How can I submit? - link(s) to an on-line preview of your music - only these tracks/releases you'd wish me to review (streaming on Reverbnation, SoundCloud etc. or f.e. Dropbox download), links to the official website or social profile(s), and the most current information about your band (line-up, so far releases, if necessary). If you prefer, you can submit your single song for a short professional critique via Music Xray too. Album reviews are technically impossible to do there. Single submissions have a fixed price, Music Xray takes a percentage of my income and charges some small fee for handling the submission too. This on-line network allows both artists and music industry professionals for an easy interaction and finding all the matching opportunities with guaranteed feedback. Sign up is free, you can link your songs from SoundCloud as well. Read more about Music Xray here. Feel free to email me at I request do not include this email to any mailing lists, or attach any mp3s until I approve them, otherwise I'll mark your messages as spam. Do you send your reviews to other magazines, forums, news aggregators, etc.? Do you guarantee any views, music sales, FB likes for my band? No, this environment is difficult to control and you need to talk to a true promoter to have these things done. I'm a music reviewer. I guarantee careful listening to your music, in-depth music analysis, wise & useful opinion, high quality writing, on-time delivery. How professional is your review? I focus only on an album, EP, songs - music content, but not on myself. I don't charge for writing about me, my dogs, my CD collection, items on my desk, meals I just ate, alcohol I drank, shows i've been to, or my expectations towards a release. No ego involved. Reviews are written from honest, subjective and objective points of view. Why can't I get it for free? Paying for my reviews won't give you any better opinion and therefore, it's not any 'shady' business. I keep things fair. I hear what I hear and I'm honest about it. Writing is a regular job thus, there's a need for being paid yet it grants you receiving a music review/PR interview under a proper, useful license. My articles are original and copyrighted. The license lets you avoid a copyright infringement. To compare, when you own a newspaper and need an article obtained in a legal way but hire no journalists, you can either find a suitable article and pay for a license to be able to use it or pay a writer to provide you with a brand new article. The same, if you need a photo/drawing/illustration for your T-shirt, album artwork, website, you must pay the author to be able to use their work for your promo and/or commercial purposes (unless they agree to let you obtain & use it under other conditions, creative commons, royalty-free, bartering etc.) In case of photos, a license is usually limited to a number of items, editions, time period, but in case of my reviews, the non-exclusive commercial license doesn't expire anytime and is not limited to a number of websites or print materials. I do paid work only. And yet the music industry has changed on both ends; music magazines don't hire so often because journalists can do things on their own, through their own blogs etc. and offer own job quality and rates directly. This allows to keep a complete control over one's work. I've 16 years of experience in the music industry, a diploma in marketing & management, know-how, careful and professional writing, a great sense of hearing and finally, bills to pay & things to buy (so have you too!). More here and Harlan Ellison - Pay the Writer video. This offer has been updated on June 30th, 2017. Changes: removal of the bonus interview opportunity for over $50 submissions (due to little interest), and the review opportunity for a multi-release submissions. Rates have been fixed to comply with PayPal fees for Poland, EU plus a foreign currency ($ to PLN) PayPal conversion fee. Twitter promo removed (I've quit Twitter, useless). Mini-reviews name changed to short reviews. Delivery time for short reviews changed. 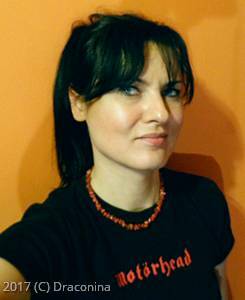 Draconina (formerly NINa) established Fabryka Music Magazine in 2001 and was supporting the industrial rock and industrial metal music scenes until 2016 when she turned the magazine into the Industrial Rock & Metal Encyclopedia. Draconina is an artistically talented person (s/f writing, ink illustrations, woodworking) who has a great sense of hearing what is on the cutting edge. Working within the magazine has allowed her to greatly increase her knowledge of music industry insights as well as develop many other skills. She writes reliable detailed reviews of heavy guitar driven music. Draconina has a degree and license in business management and marketing. Since graduating in 1998 from business management she also obtained a license in graphic design in 2000. Polish is Draconina's primary language, but she speaks English fluently, allowing her to communicate with a variety of foreign nationals from all over the world. She's been designing original CD cover artworks since 1994 and working on her debut post-apocalyptic multimedia book (Heatwave) since early 2010. Her creative approach has also resulted in woodworking, as well as ink drawing & blackletter/gothic calligraphy. Enjoy her original work on Deviantart. Finally, Draconina's an avid rocks, minerals and gems collector too; see her collection here.